Zifam Krill Oil contains high quality Antarctic Krill Oil providing support for heart and cardiovascular health which is important for overall well-being. Krill Oil is source of Omega-3 which is found in large concentrations in the cells of brain and eyes. Krill Oil contains omega -3 fatty acids EPA and DHA in the phospholipids form, which are more easily absorbed than the triglyceride form of omega-3 that is found in fish oil. Krill Oil also naturally contains Astaxanthin, a potent antioxidant, to help fight free radicals and maintain and improve eye health. 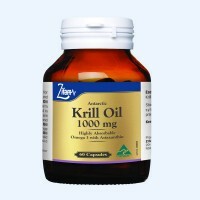 Krill Oil may assist in providing temporary relief of symptoms of mild arthritis and may help improve joint mobility.